Shizuka, usually called Shizu-chan (静ちゃん) or Shizuka-chan (静香ちゃん), is the smart, kind, and pretty neighborhood girl who is the object of Nobita's affections. She takes baths several times a day. Nobita often disrupts her in the bath due to some misuse of Doraemon's gadgets, resulting in Nobita's head getting dunked. She is also known for taking piano lessons unwillingly, which is sometimes used as an excuse for declining to hang out with Nobita. Her true passions are sweet potatoes, which she'd rather keep to herself out of the knowledge of others, and the violin, in which her playing is as atrocious as Gian's singing. 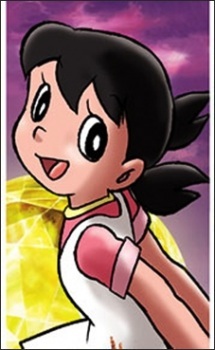 Due to Doraemon's intervention, Shizuka will become Nobita's wife in the future timeline, and the mother of his son.